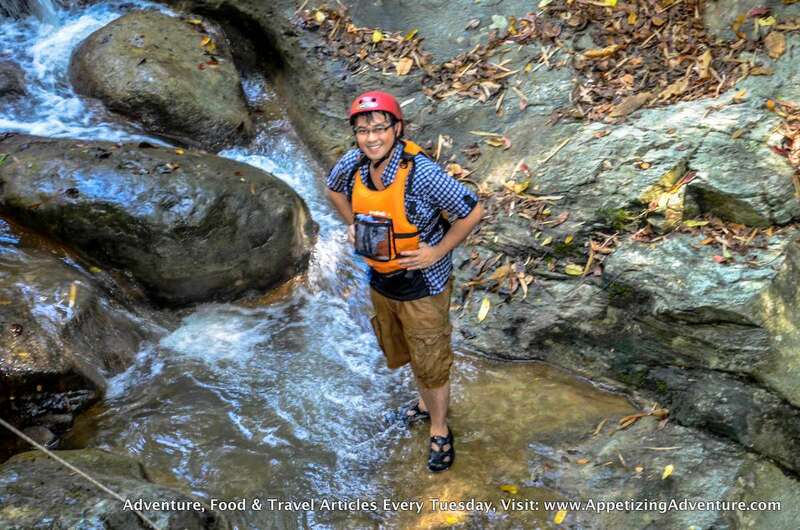 There are four activities a tourist should experience in Mapawa Nature Park for maximum fun and adventure. 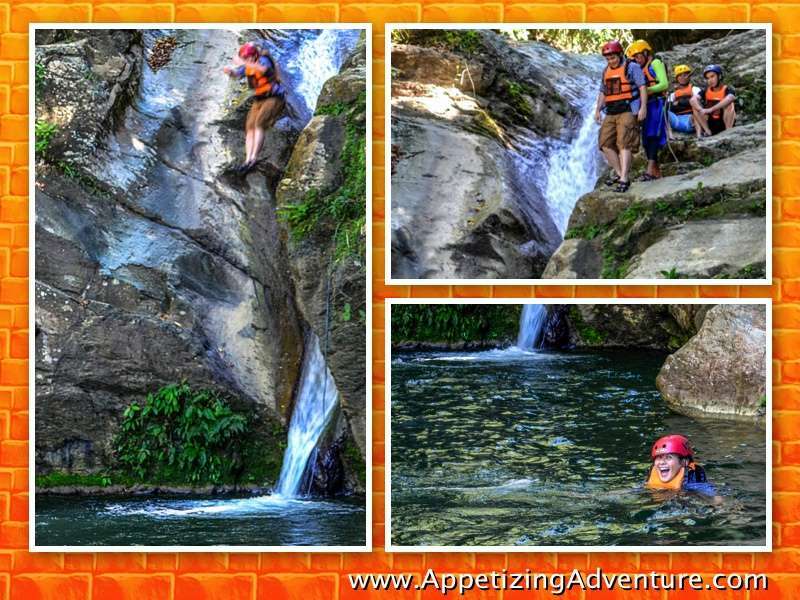 Slide from a 20 ft. high waterfall, body rappel during the trek, jump from a 25 ft. high cliff and rappel 65 ft. down. 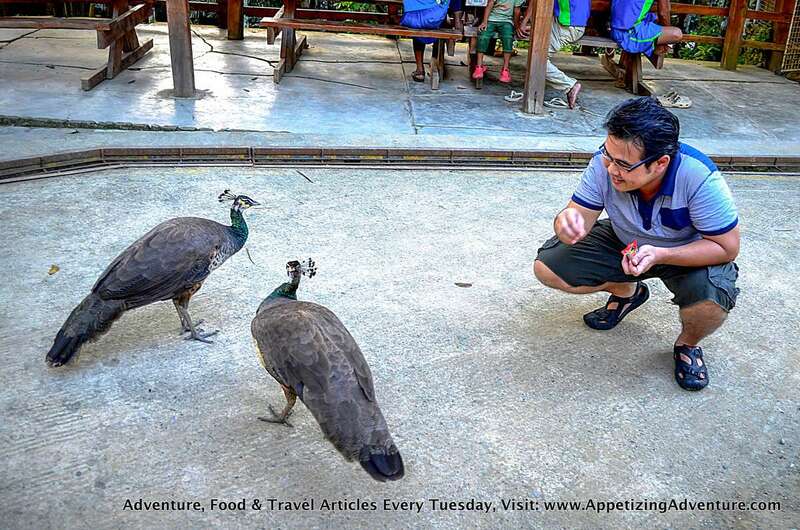 Mapawa Nature Park offers all that in Cagayan De Oro City. From the receiving area of the park, we wore helmets and life vests and rode to the drop off point to begin the trek. After walking for 15 minutes, the first activity was within reach. I looked from the top and it’s 20ft. high, not too high, but high enough for me. It looked very exciting, to slide from the falls and splash into cold water. The facilitator told me to sit, put my glasses in the pocket of the vest with the zipper and cross my arms. The water was flowing and I could feel my behind wet, as well as my legs. That made my heart beat a little bit faster. From where I sat, I couldn’t see what’s below and I liked that because it made me less nervous. Then, the facilitator pushed me. I started sliding down and everything happened so fast. A couple of seconds to slide, then the plunge. I went in the water. It was soooo cold. Thank God for the vest, I floated without any effort. I wanted to do it again, feel the rush for the second time. But it’s a one-time only. I swam to the rocks and climbed up. It’s another trek to reach the second activity. Throughout the whole adventure, the trek took more than two hours but surprisingly, it didn’t feel that way. Why? It wasn’t just walking. We had to walk, swim, climb up, walk, swim again, and every so often, we stopped to have pictures taken. Some of the rocks are slippery so be careful. Don’t run, don’t rush. Enjoy but be safe. You won’t want any accidents or anything untoward that could spoil the fun. 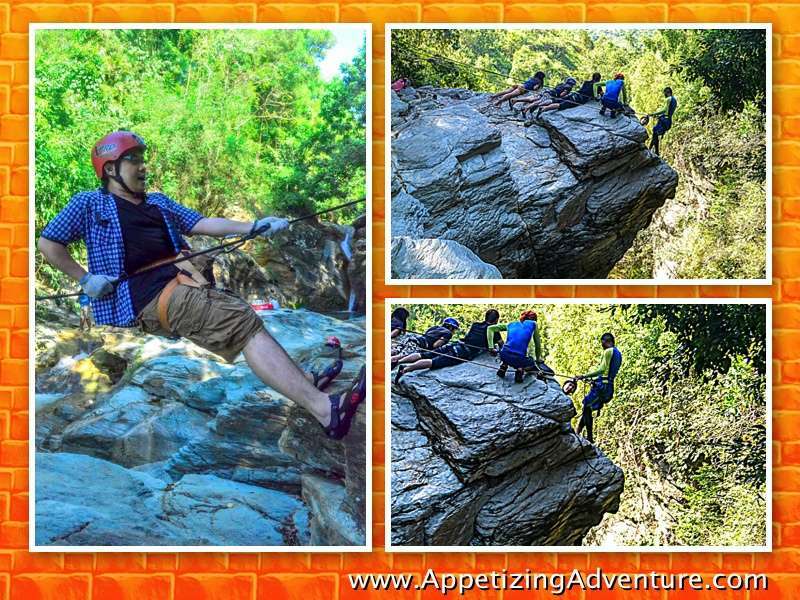 The second activity’s the Body Rappel. Along the route, there’s a small waterfall you have to get past. My rough estimate, it’s about 10 ft. high. 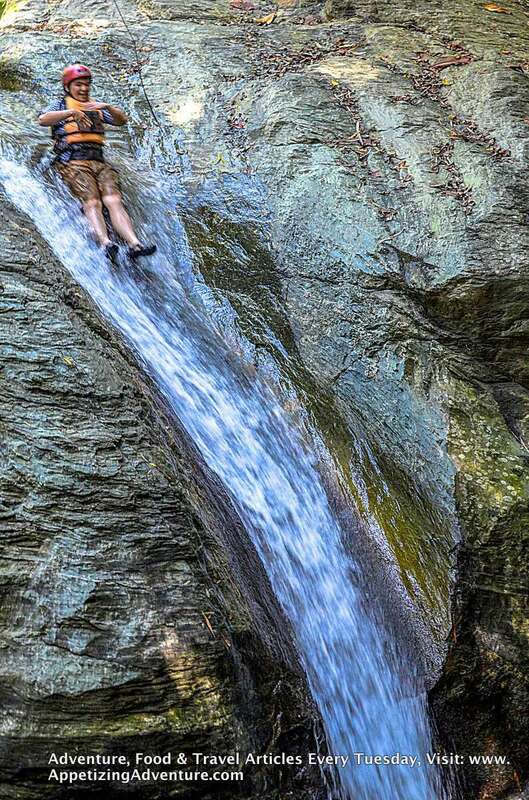 You can’t slide down, because the water below is shallow and the rocks can surely injure you with the impact. The solution to keep on going’s to do the Body Rappel to go down and proceed with the trek. Facilitators secured two ropes. I had to do the Body Rappel backwards. One of them was positioned at my back, just in case I lose my grip, he’ll be sure to keep me safe. One rope for each hand, I began walking backwards, going down. I had to do it slowly because flowing water made the steps slippery. I made my way down. It was a bit tiring for my arms. The water below was just above my knees. But I’m glad I went through that. Upon reaching the 25 ft. high cliff, my heart pounced. The facilitators assured me that the water below is at least 15 ft. deep so there’s no need to worry if I’d hit the bottom, there’s just no chance especially with my life vest on. Standing on the edge of the cliff, I kept on telling myself it’s just 25 ft. and it’s going to be fun. But I was all weak in the knees. My guide told me to make sure I jumped with my feet together as if in a standing position, my hands clipped to my sides or on my chest, or have one hand on my nose. The impact of the jump into the water can be painful if legs or hands are spread apart. To avoid water entering the nostrils, it was okay to keep the nose pinched during the jump. I took a deep breath and jumped in standing position. Whoa! The free fall down was nerve-racking which made it a whole lot of fun. Then it was the splash. When I hit the water, I was under for a few seconds before I floated and was able to gulp air. Imagine, if not for the life vest, I probably would’ve gone deeper into the lake and would’ve taken longer for me to swim up for air. One other participant who jumped didn’t do it with the standing position, instead his legs were spread apart. The result? His shorts were partly ripped from the impact. Another who jumped with legs spread apart with a different angle hit the water and had painful impact in the groin. So remember to jump with the standing position. Part of the package was lunch. Before the last activity, we rested, drank a lot of water and had rice, chicken adobo, and egg. While eating there were two kids playing and I was amazed. They grabbed the vines hanging from the trees and swung like Tarzan. Those vines probably wouldn’t be able to stand my weight, pretty much for kids only. Now, for the final activity. There’s a 65 ft. high waterfall and we’re supposed to rappel down from there. I tried to take a look and I had to take a deep breath. I thought hard. I asked if there’s a trial rappel and the facilitators led me up to some big rocks. They strapped me with the harness and ropes. I tried to rappel the way they would from the 65 ft. high waterfall. Boy it was painful. I was overweight. The part of the harness around my legs were carrying my weight and it was causing pain. I realize I will have to shed pounds so my future rappels wouldn’t be as painful. I skipped this part. But the others went through with it. They rappelled down. Here’s a tip, use your feet against the rocks, not your knees — that can cause injuries. There’s a floating rubber tube waiting below. This is what you’ll use, to stay afloat because you won’t be wearing your life vest during the rappel down. 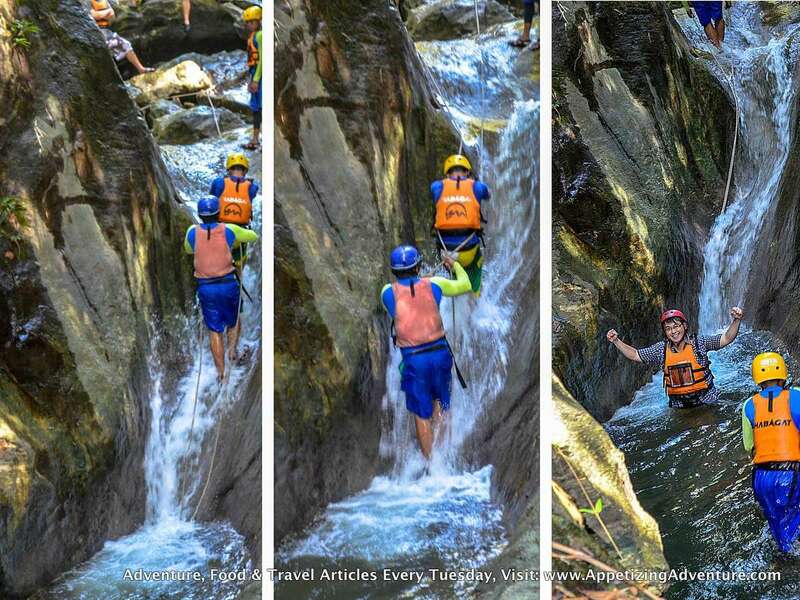 This whole experience, which took more than five hours, is what the Mapawa Nature park calls canyoneering — defined in the dictionary as the sport of exploring canyons through swimming, rappelling or climbing. 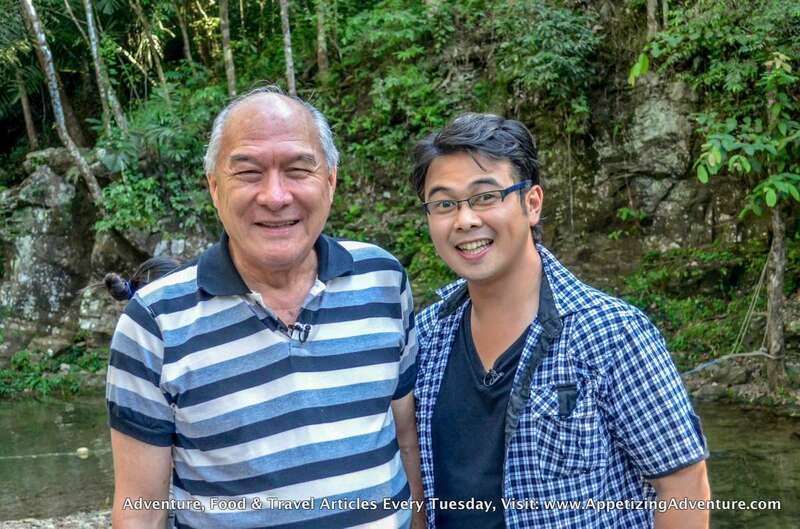 Mapawa Nature Park is a 2,500 hectare eco-tourism destination 30 minutes away from the city proper still within Cagayan De Oro City. 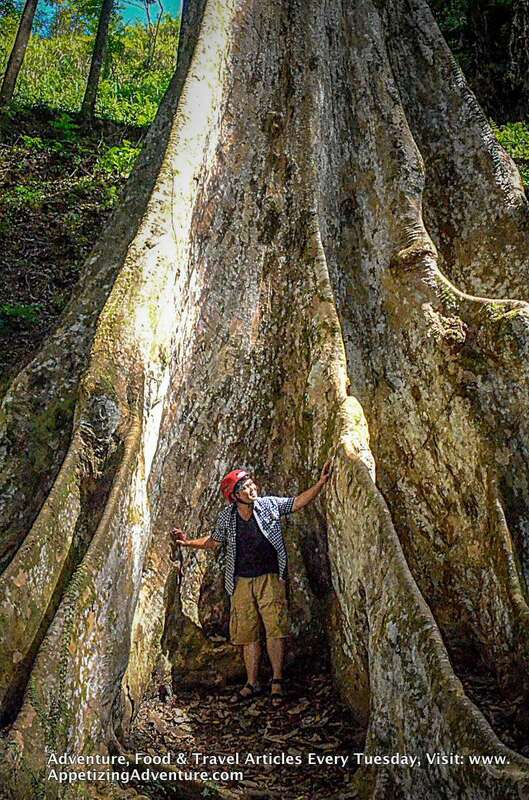 One of the owners, Ernie Pelaez, boasts about the exquisite flora here, especially their trees which are centuries old. Like this one which made me look like a dwarf because of its enormity. This place is also great for team building activities. They can have customized activities specifically for this. 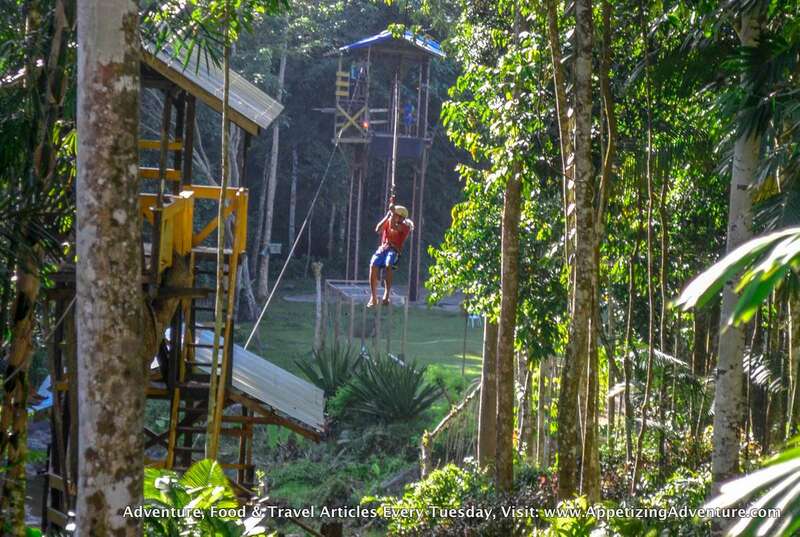 They also have ziplines, campsites and playgrounds. Peacocks also roam around the park freely. I fed them with corn. I think they liked it. 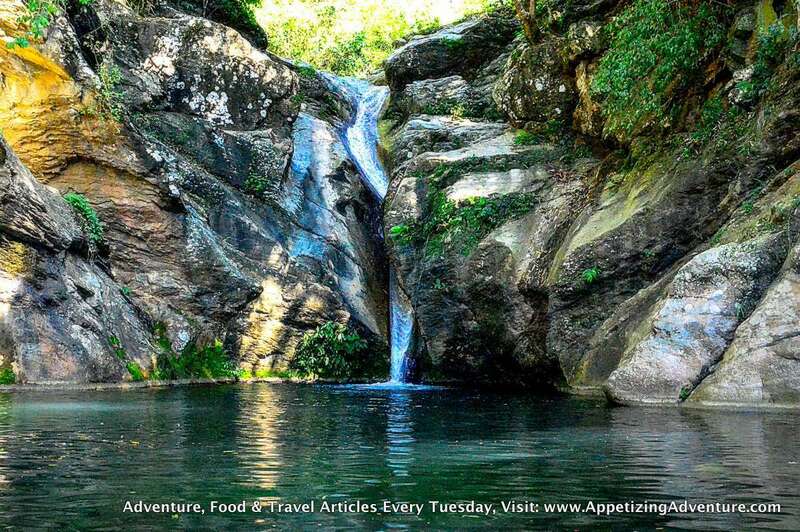 To get here, you can rent a van and tell the driver to proceed to Mapawa Nature Park in Barangay Cugman if you’re already in Cagayan De Oro City. 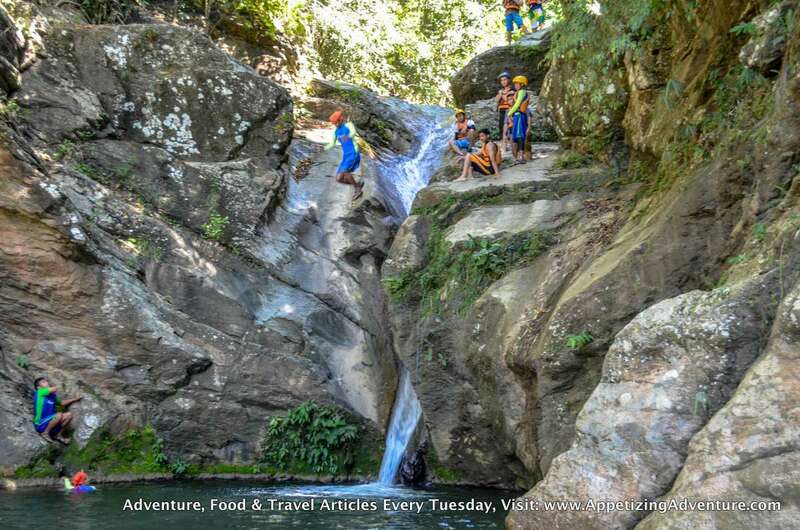 It’s best to call days ahead so the facilitators can prepare and inform you if the place is okay for canyoneering, if the weather is good or if it’s already fully booked. Nice Blog! 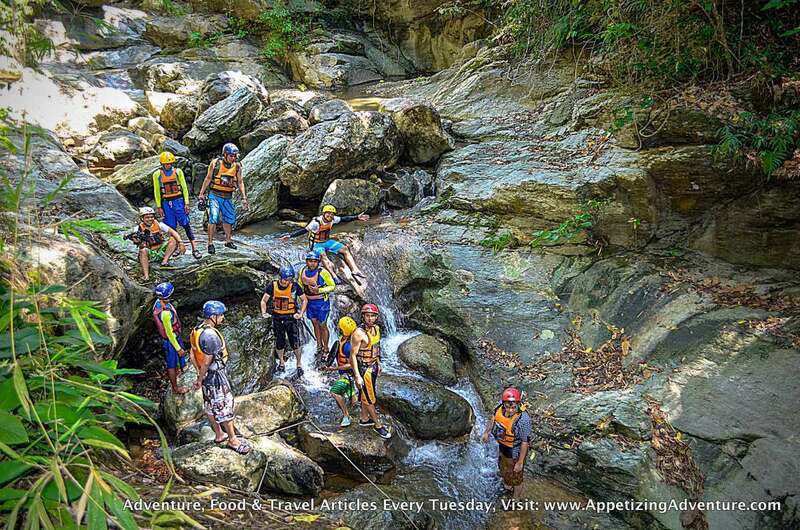 Just a question though, how long did you complete your canyoneering activity? We’re planning to do it when we go to CDO this June. Mapawa nature park is a wonderful place to spend a weekend with your friends and even with your family. 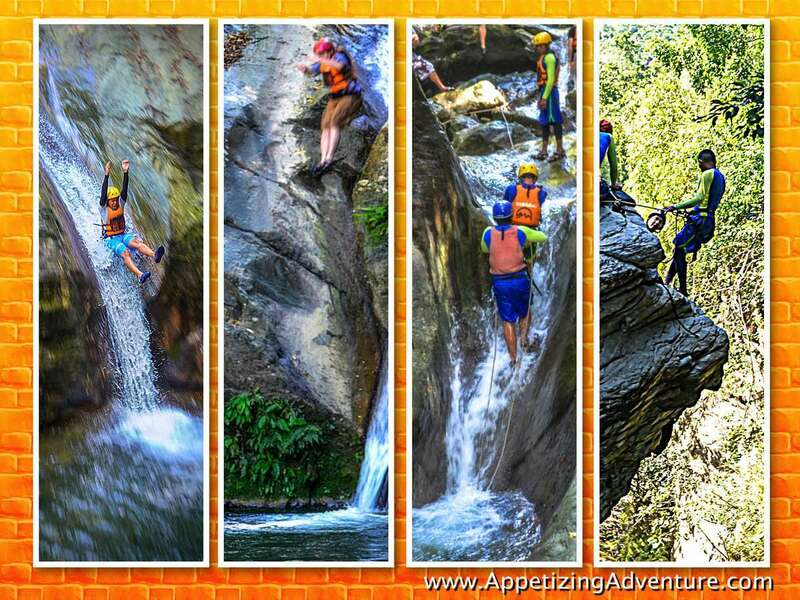 The fun and thrilling activities will make you feel like living in houses at CDO is worth your money. Your experience sure feels like quite an adventure. How long will it take to do all of these if we go early in the morning? What Mapawa Nature Park can offer to us? We are planning to have our Educational Tour this November 25, 2016. We hope you can reply to us. Thank You. Sorry sa super late reply. I think people from Mapawa would be able to give you the most accurate answer.